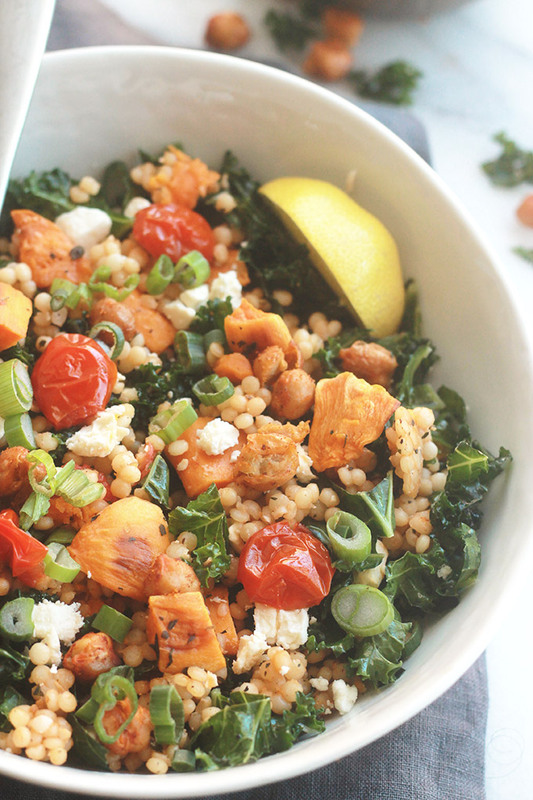 Ready for a supercharged, healthy, hearty salad? 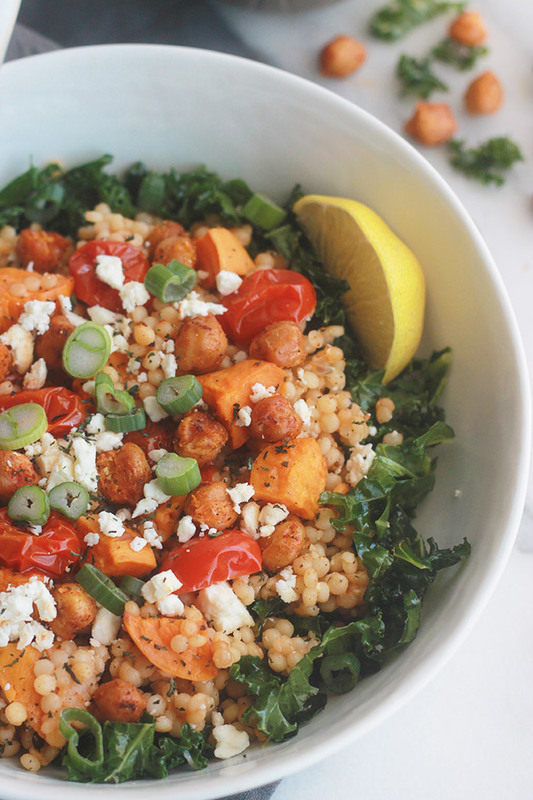 You’re going to love this Israeli Couscous Kale Salad with Feta it’s made with tender Israeli Couscous, roasted tomatoes, sweet potatoes and chickpeas tossed with seasoned fresh kale. Growing up I can remember having salad mainly in the summer or as a side dish with a meal. 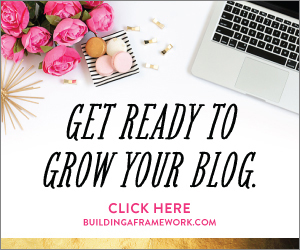 Salads can be more than a quick summertime meal, with all of the delicious greens and grains salad combinations, salads can be very filling and have a comfort food feel. I used Israeli couscous, also called pearl couscous, which is a pasta, its tender bite is perfect. However, for variety Quinoa, Farro or any other grain could be used in this salad. After roasting the sweet potatoes and tomatoes, they both get mixed in with the couscous before tossing everything with the seasoned kale. This salad passed the Taylor Test. Taylor, my daughter who is a very picky eater can be very resistant to new or different foods, if she try’s it and likes it, you can be sure it’s a winner. And it’s easy to make. Loads of dressing is not needed, I simply drizzle a bit of extra virgin olive oil and squeeze a wedge of lemon over the salad before tossing on the feta. 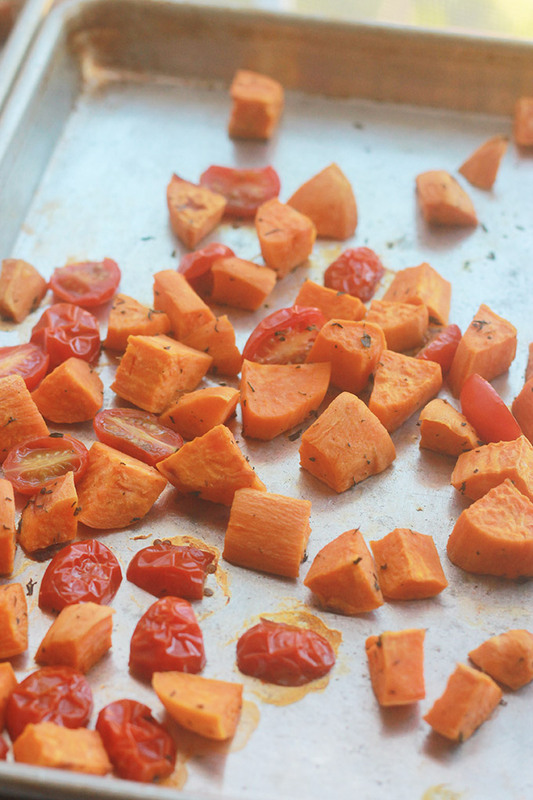 Place sweet potatoes on a shallow baking pan, drizzle with olive oil and sprinkle with 1 teaspoon of the thyme and a pinch of salt and pepper, toss to coat. On another shallow baking pan toss the chickpeas with a drizzle of olive oil, smoked paprika, salt, and pepper. Place both pans in the oven, place potatoes in the middle and the chickpeas on the top rack. Roast 20 minutes. Halfway through add the sliced tomatoes to the potatoes and toss. 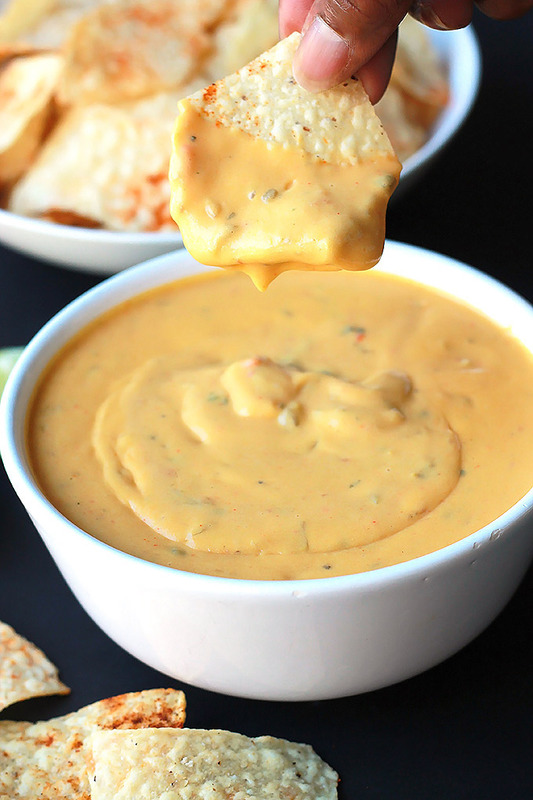 Also, toss the chickpeas. While the chickpeas are roasting they may start to pop. While veggies and chickpeas are roasting, heat 1 tablespoon olive oil in a medium pan, saute garlic until fragrant, add couscous and remaining thyme and season with salt and pepper. 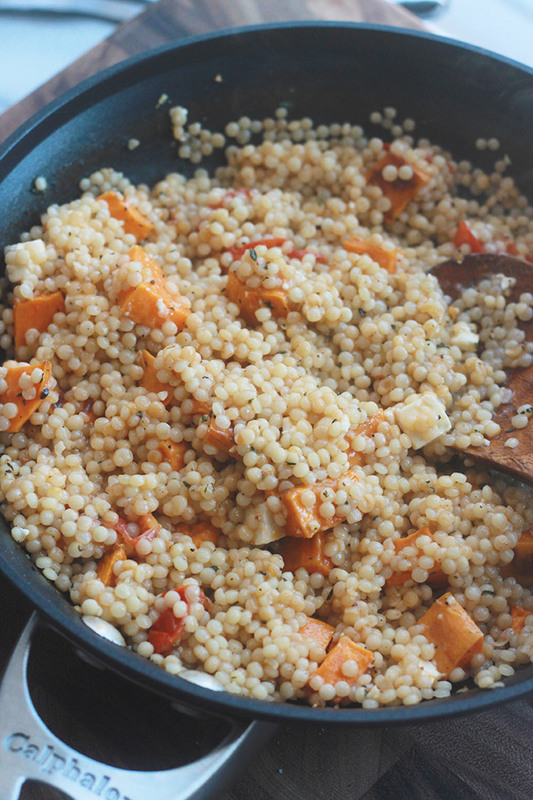 Cook, tossing until couscous is lightly toasted, 2 to 3 minutes. Stir in the vegetable stock, bring to a boil, reduce to simmer and cook another 10 to 12 minutes or until couscous is al dente. While couscous is cooking place kale into a large bowl and drizzle with 1 tablespoon olive oil, juice of half a lemon and sprinkle with sea salt. 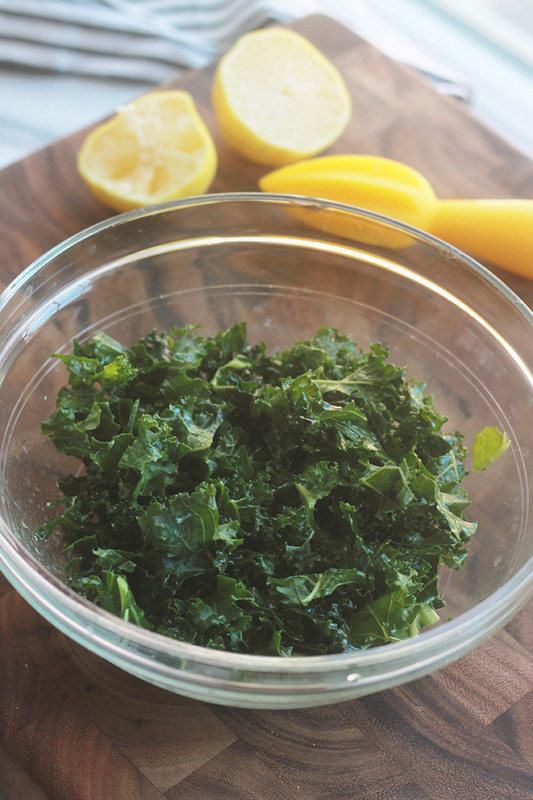 Toss and massage kale between fingers until well coated, set aside. Remove couscous pan from heat. Add half of the veggies and half of the feta, a squeeze of half the lemon and toss to combine. Add couscous mixture to the kale, toss, add remaining veggies and all of the chickpeas. Plate salad and sprinkle with scallions and remaining feta. Drizzle with a bit of olive oil and squeeze on fresh lemon juice, enjoy! If you make this recipe or a version of it, take a picture and share with me on Instagram, tag it #thewholeserving or leave a comment below. 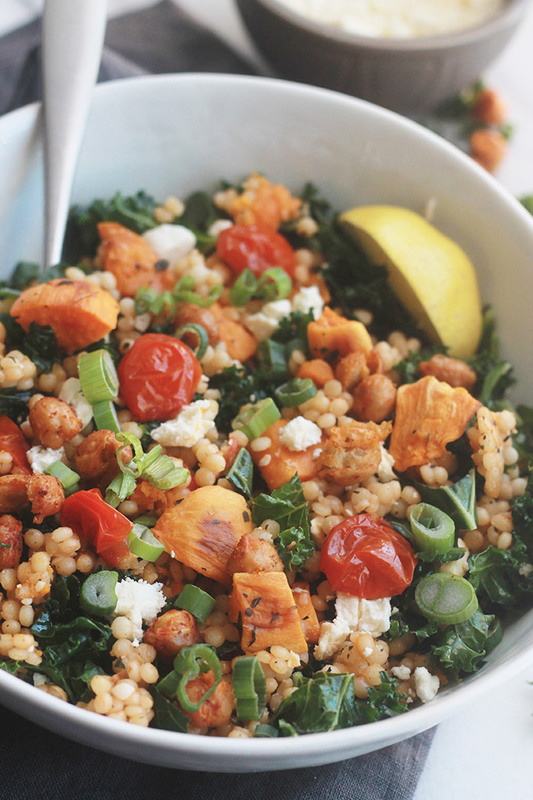 I’d love to see or hear about your version of this Israeli Couscous Kale Salad with Feta.